This aviation experience is thanks to our ever alert FASF member and former Marine Corps Jet Fighter Pilot, Jerry Dixon. Jerry has given us some other fascinating aviation insights before, so we hope he and you other members will continue to bring us these interesting insights into the world of aviation. THANK YOU JERRY! In foreground is a partially dismantled Lockheed T-33 Trainer, which in the early to mid 1950’s was the first jet flown by most Air Force and Navy Pilots in their training experiences. Behind it sits a once proud Boeing B-47 Strategic Bomber operated by the Strategic Air Command (SAC) as an effective deterrent during the Cold War to keep the Soviet Union at bay. 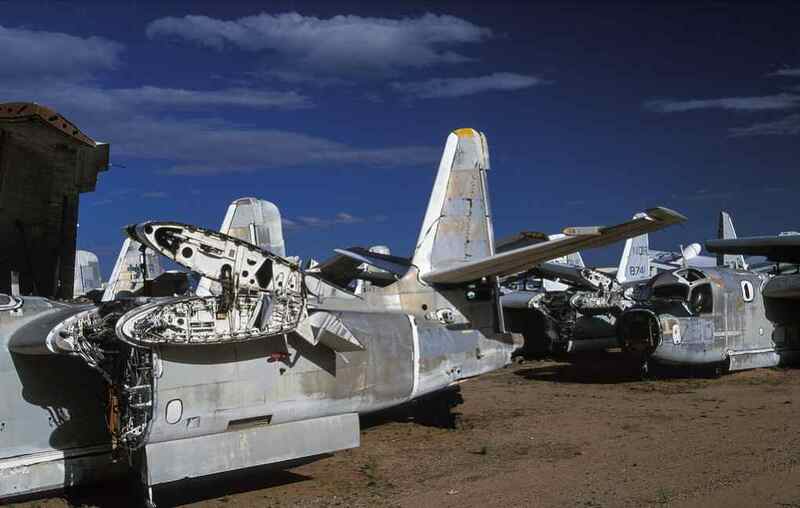 This huge Tucson airplane graveyard is operated by the USAF’s 309th Aerospace Maintenance and Regeneration Group. This photograph shows the Navy’s version of the indomitable Douglas DC-3 Airliner, which the they labeled the R4D, and the USAF, the C-47. The DC-3 and its military versions were first produced by Douglas in the mid 1930’s and entered their first commercial scheduling in 1936. The DC-3 was continuously produced until 1942 and even the Russians and Japanese produced models of this ubiquitous aircraft. All in all, some 16,000 of them were built and many are still in use today, some outfitted with modern Jet-prop engines along with many other upgrades, such as currently in use by the U.S. Forest Service Fire Fighting Operation. Many are also still flying regularly in third world nations as their principle airline equipment. Here are some of the many Boeing 707 Airliners in their USAF configuration, which was for aerial refueling and called the KC-135. Some are still in use by the USAF. The 707 was America’s first commercially successful Jet Airliner, entering full service with Pan American Airways in 1958. The civilian models are mostly retired, but many remain in service throughout the world to this day. In foreground is the mainline jet fighter in the latter days of the Korean War of the 1950’s, the North American Aviation F-100 “Super Sabre” all-weather jet fighter. The F-100 was our first front line supersonice fighter. 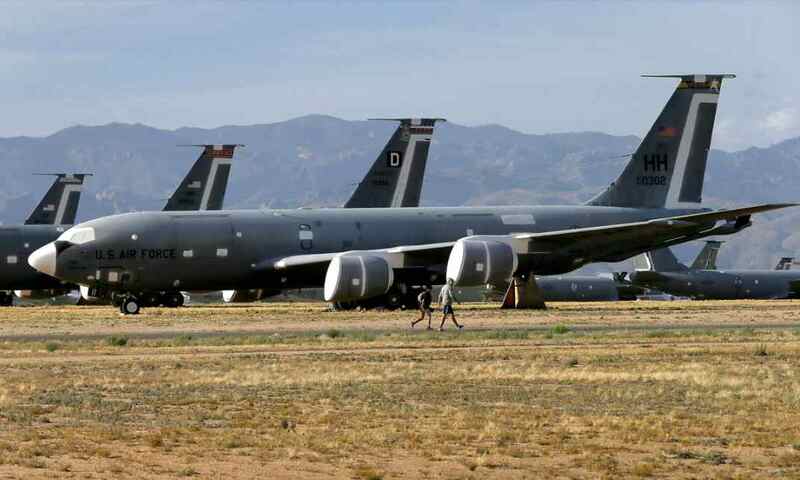 Many of the stored aircraft at Davis Monthan are thoroughly mothballed, as is this ship, which means they can be put back in full service in an astoundingly short period of time, should an emergency call for their reactivation. This is a strange looking aircraft, and doubtfully an American designed ship. 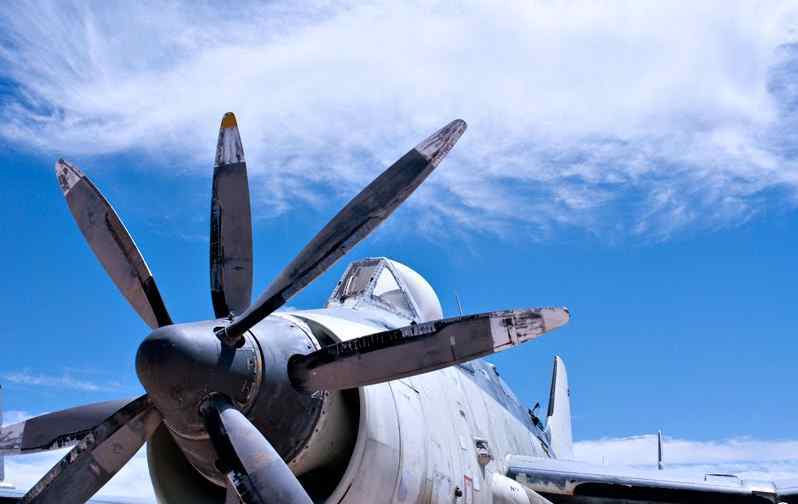 It appears to be a British Royal Navy Fairey Gannet Anti Submarine Warfare craft, built in the early 1950’s, but if you think we are wrong in this description, then please let us know and we’ll give you credit for the correction! Notice that it has contra-rotating propellers and appears to be turbo-jet powered. 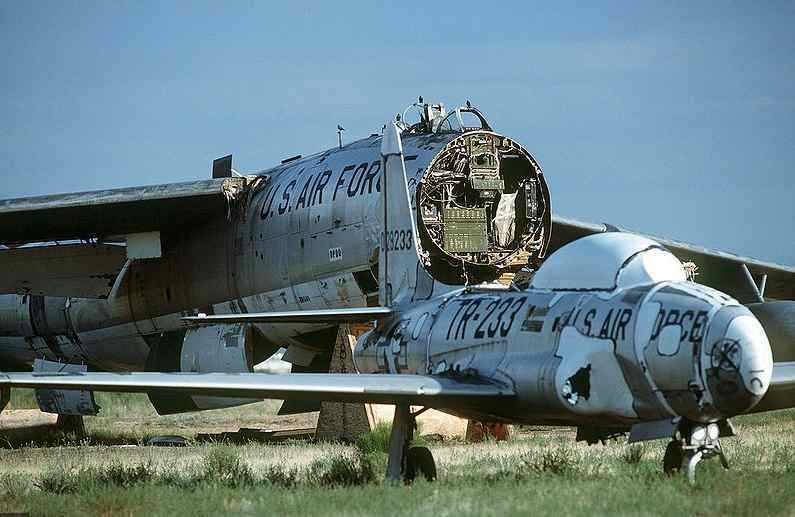 What it is even doing, being stored at Davis Monthan, remains another mystery. Thanks again, Jerry, for the great and even specacular moving 360 degree panoramic view of the world’s largest airplane graveyard. When your Webmaster first viewed the astounding aircraft storage facility as seen above, he couldn’t but marvel at and wonder about this large piece of American Military History, especially how these planes helped the U.S. maintain the peace during the Cold War era and of the literallly thousands of young Americans who trained in and then flew all of these pieces of aviation and American history over the years. Also not overlooked is the massive amount of tax-payer funding that went into generating these thousands of war planes! 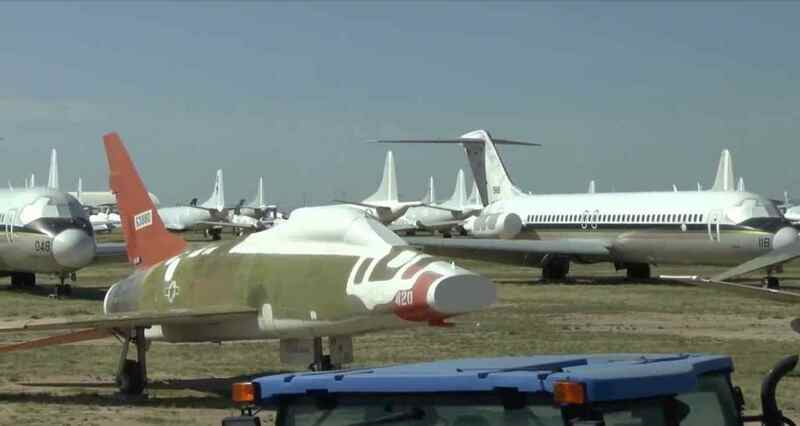 Several of you have wondered at why some of these ships aren’t being loaned out or gifted to the many aviation dedicated museums throughout the U.S. and even abroad. Please let us know your feelings about this question right here, online and inside our “LEAVE A REPLY” fields, which you will find on most of our website’s pages. We always love to hear from you! This entry was posted in AVIATION NEWS on February 10, 2016 by FASFRIC. Been there many times Ric. You can get a guided tour of AMARG from Pima Air Museum on Valencia street in Tucson. It is well worth the trip. Great presentation! Thanks, Frank. Glad you enjoyed the aerial 360 degree tour. I almost mentioned the PIMA AIR MUSEUM, so glad you brought it to our attention. They certainly have a great collection of aircraft. 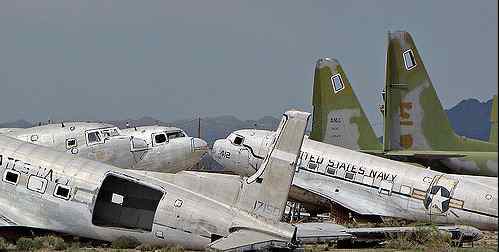 I belonged to it for years – but didn’t know about the tour of the boneyard. So it’s a good bit of useful news for our readers, some of whom might want to take that storage junket as well as visit the Museum. The museum is conveniently located right on the Interstate Freeway (I-10) just South of Tucson, for those of you who might be passing through Southern Arizona. You can also visit our “LINKS” page (upper tool bar on FASF Home Page), where you’ll find the PIMA facility listed under Museums – and the site enables you to take a virtual tour of the place, as well.